Celtic Art speaks to us through an intricacy of symbol and form, that enchants while it mystifies, and yet is somehow the perfect way to talk about that which is abstract, sometimes invisible and yet essential. Throughout the many challenges and migrations of the Celtic people, the Folk-Soul sings of the beauty of life, even within the darkness – perhaps particularly then. This is the language, the poetic key to the Mysteries, that is the source of my inspiration and journey as an artist. 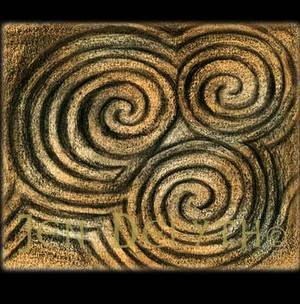 Celtic artwork is rhythm, and it is this rhythm we feel interacting with the ancient patterns – the cadence and language of the Earth. The patterns reflect the beat of the earth, the movement of the moon across the sky which draws the sap of the plants – the growth and waning of our lives, and that of the seed to the sapling to the tall tree and all back to the earth again in a great circle. The sacred Spiral and her triple manifestation symbolize the ancient Earth Goddess and her seasonal cycles. The Labyrinth, or key-patterns, speak of the ancient journey to the center and out again. The Tree of Life celebrates the verdant force of nature, the fruitful vines of growth and sustenance, and the sacred animals are totemic archetypes representing their qualities of strength, fertility and intelligence. 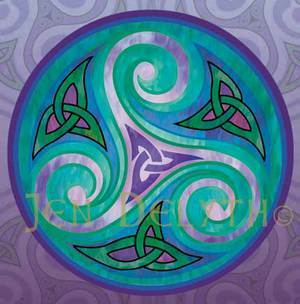 Celtic artwork describes this rhythm at the heart of things. The elements within the designs are rooted in a far more ancient culture, where the language of the artists was directly connected with the Earth Mysteries. Sacred patterns within the Gavrinis chambered cairn in Brittany (dating back to 3500 – 4000 BC) and the megalithic passage tomb at Newgrange, Ireland (3200 BC) are good examples of this.